Be Old McDonald and Have a Farm. Milkstone Studios have developed and published many games over the years, one of which, Avatar Farm, is the basis for Farm Together. Their first game Avatar Farm was a framing simulator that borrowed ideas heavily from titles like Harvest Moon, Animal Crossings, and the Farmville series. 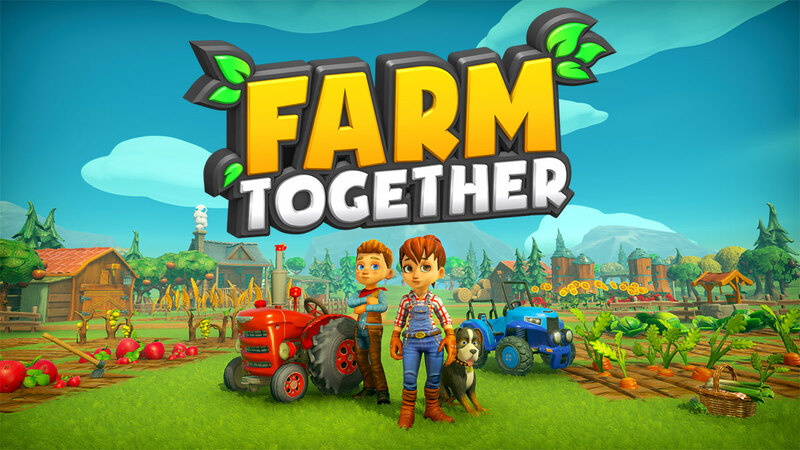 Farm Together is both a visual and mechanical upgrade over its predecessor, and a well put together simulation game. Paired with the Nintendo Switch, Farm Together is a great pick up and play game that begs for daily attention. There isn’t much of a straight-forward story in Farm Together, with most of it the result of how you set up and design your own farm, interacting with the environment throughout your playthrough, as well as with others in multiplayer. Do you want to focus on animal husbandry, being an arborist, or growing vast fields of vegetables? When you start off in Farm Together you can choose to start with a balance of land and money or challenge yourself and start off with next to nothing and work hard to build up a pile of money and create a town all on your own. The gameplay of Farm Together consists of basic field building in blocks, usually 3×3 square sections. From there you can visit the shop and fill the square, or sometimes larger blocks, when it comes to items, with things like vegetables, trees, animals, fish, and flowers. Each of those items has a set season or time frame in which they take to become harvestable. For instance, a plot of lettuce takes 10 minutes to grow, and can be sped up while adding water to it. The lettuce though only nets you a small amount of money compared to some other vegetables that may take 2 days to grow. The difference between pennies on the dollar and a few thousand dollars is how long you are willing to wait through the growing process. Trees on the other hand, have one set cost and will continue to be harvestable during the various seasons. Some trees harvest each season, which changes every 17 minutes of real world time. While other trees may only harvest once in an in-game year, or two out of three seasons. Trees will net you money, diamonds, and/or XP each time you harvest them. More on the various currencies in the game later. The animals in the game vary from chickens, pigs, horses, cows, goats, and more. Each animal type will give you resources like eggs, mushrooms, milk, wool, and more that can be used to turn into other items, or sold at the various marketplaces for money, diamonds, and XP just like the fruits and vegetables. You can also buy fish and form small ponds and fish in them throughout the various seasons for money and resources. The fish span a variety of sharks, small pond species, clownfish, anglers and more. You don’t need to feed the fish and once you make the pond they will continue to be harvestable, which is a nice although a somewhat long way to generate money and resources from fishing. There are other items you can place and plant in your farm to decorate the area, as well as resource selling buildings. There are fruit and vegetable stands which will turn your harvested resources into cash and diamonds. Each time you harvest a plant, flower, or tree, you add to your resources and can turn that into money or XP. Decorating your farm comes in the form of fences, walls, lights, lamp posts, wishing wells, roads, pathways, and more. These unique design decorations help to personalize your space and make your town uniquely yours. When you visit other towns, you may see ideas on what to do with layouts and decorating patches of ground with items. Personally, I have started laying out my patches of farmland and roadways to feel more like a town. I have visited other towns where the layouts just seemed like large swaths of fields only working to gain money and not really ‘designed’ to be a town laid out that made a lot of visual sense. As you plant vegetables and harvest fruits, fish, animals, and etc., you add to each item’s level. Your leveling up of items slowly increases the amount of money you gain each time you harvest them. By doing this, Farm Together nudges you to grow all different types of items so you don’t focus on just items that give you the most amount of money. Along with the leveling system, there are quests that you can work through which give you ribbons, XP, money and more. These quests may require you to grow a certain amount of vegetables and fruit types, or harvest animals and fish, or build a certain building type. This method of encouragement is a nice additive as there were items that I would have never used or things I rarely planted due to either the time it takes to harvest or low-income items. It also forces you to plan out what you will grow and plant to accomplish the requirements of your active quests. A few levels in, you acquire the ability to use a tractor, which lets you harvest up to nine blocks at a time, as well as, watering your plants and flowers within a small area. Once you have the tractor you will need to manage your fuel level which can be refueled by placing gas stations around your map. Each time you plow, harvest, or water a plot of ground while using your tractor, you slowly drain your fuel level. As you gain levels you start to unlock the ability to add houses to your farmland. Once you have access to houses you can enter them and add regular household items to each room like sofas, chairs, tablets, etc. You can construct each room the way you want with items, much like Animal Crossings allows you to design your own home. You can also paint your walls and change your floor designs. Another aspect of Farm Together, which I haven’t talked about yet, is the online portion of the game. of your farm and inviting guest or friends into your farm. Your farm can have up to 8 people in it at one time. Those people can be friends from your Switch Friend’s list or random strangers you allow into your farm. You can set it up so that people can only harvest items, but not plant, or the far extreme, do anything to your town. When friends come to visit they gain a short experience boost when they go back to their own farm which increases harvest money and resources. Visiting a farm has limitations due to the Switch’s limits on voice communication. Farm Together circumvents this somewhat with a simplistic emotion system which you can assign to your up, right, down, and left D-pad buttons. This is very similar to how you have emotions in Animal Crossings. A text input ability would be nice to have, but obviously communication with random people can often lead to bullying or other unwanted advancements. One thing Milkstone could implement would be a way to communicate with people on your friends list. There is a guestbook you can add to your town which people can leave pre-made messages in, but again that is limited in scope. Visually Farm Together is a mix between the Animal Crossings and Harvest Moon style with its own little flairs added here and there. Some additions include the variety of vegetables and their growth stages from seedling to harvest time. As seasons change there is a flourish of dandelion petals, leaves, snow and more. Each animal is designed in a slightly over exaggerated cartoon style which adds to the character and charm of Farm Together. Farm Together has a subtle amount of music and audio none of which is loud or obtrusive. You will however, hear the same sounds repeatedly. For instance, every time you plow the ground or plant vegetables you will hear the same sound over and over. It’s subtle, but can become somewhat annoying if you are playing Farm Together for longer periods of time. There is background music in the game and some of the emotions you can use with visitors that travel to your town make random sounds. My favorite is the whistling to get someone’s attention. Farm Together does have some small gaming hiccups from time to time. Frame-rate drops happen often as trees and plants pop in as you get closer. Occasionally I noticed slowdown with the game, but it never really inhibited me from playing or lessening my enjoyment. Having multiple friends in your farm does lead to some slowness, but that is to be expected in wireless game play on the still developing Nintendo Switch Online Service. Farm Together is a nice game to hold you over while you wait for Animal Crossing. The game itself feels a bit like a mobile game that has you checking in daily from time to time and vying for your attention in short burst to build a thriving farming community. You will spend a lot of time plowing fields, planting vegetables, and harvesting them to build up income. The early stages of the game seem like a slog but as it opens up to more land areas to build and farm in, and gain access to higher income producing crops you will soon see your farm grow. Having the ability to drop in and out of farms belonging to friends or complete strangers and gaining boost abilities is a nice added feature. The way you build your farm and how fast you build it up will depend on how much time you want to spend within the farm itself daily versus growing crops that take a day or two and not checking in every day. All in all, Farm Together is a really fun experience either by yourself or with friends but is limited in your friendly interactions due to the Switch’s lack of voice options. Emotions are fine but limited to the four you customize to your farmer.